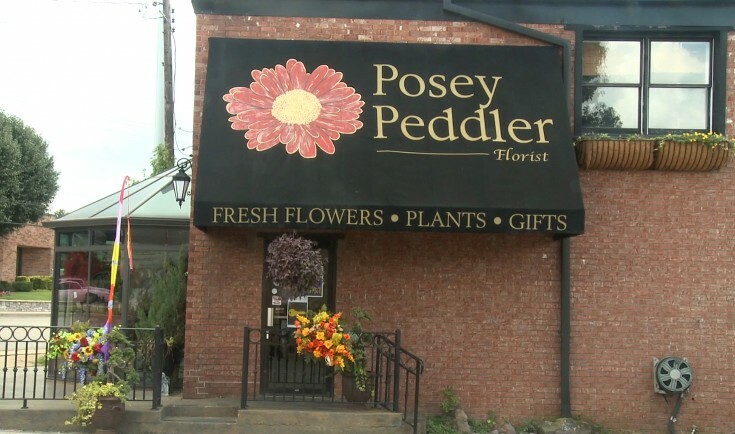 Posey Peddler – A Florist Improving Customer Service! As part of Customer Service Week, (October 7th-11th) we wanted to share with you one of our members who is working hard to boost customer service and sales in their flower shop. Bridgette Mills Arnold, a 30 year veteran of the floral industry, is the owner of Posey Peddler in Joneboro, Arkansas. The shop has been a fixture in the Jonesboro area since 1998 and serves the local community with custom gifts, flowers, plants and home decor. Recently Bridgette brought in customer service and sales guru Tim Huckabee of Floral Strategies to conduct a workshop with her employees. Floral Strategies is the only on-site training program in the entire floral industry that teaches critically important customer care skills. This specific training empowers flower shop workers to give extraordinary customer service. As you can guess, this makes for happy clients that keep coming back. FSN visited this bustling flower shop during their training seminar. Check out this video of Posey Peddler’s day with Tim Huckabee. FSN Members: CLICK HERE to login & learn more ways to improve customer service and sales with specific tips from Tim Huckabee. All-Flower Floats In This Parade Will Blow Your Mind! I just saw photos from the 2012 Bloemencorso Zundert flower parade in Zundert Netherlands. To say the least.. mind blown! Bloemencorso Zundert is the largest flower parade in the world entirely made by volunteers. The parade takes place on the first Sunday of September. Foats are large artworks made of steel wire, cardboard, papier-mâché and flowers. In the Bloemencorso Zundert, only dahlias are used to decorate the objects, and it takes thousands of them just to cover one float. The huge floats are made by twenty different hamlets and each of them consists of hundreds of builders, aged 1 to 100, who are all equally crazy about the bloemencorso. The older members of the hamlet are often responsible for planting and growing the dahlias, while the younger ones build the float in large temporary tents that are built exclusively for the event. The bloemencorso is also a competition. A professional and independent jury decides which float is the most beautiful and which hamlet will be crowned the winner of that year. We just found this great video from back in 2007 that features one of our member florists and thought I’d share! Meghan Carter, host of Ask the Decorator visits with Vickey Wenshrup of Amelia Florist Wine & Gift Shop in Amelia, Ohio to learn a few DIY flower arranging pointers. Don’t miss the video at the bottom of this post! At the beginning of the video, Meghan asks, “How hard can it really be to make a floral arrangement?” By the end, she adds, “flower arranging isn’t as easy and you would think!” There is a whole lot more that goes into flower arranging that just putting flowers into a vase. Florists are truly artists, but also have to be meticulous in their efforts to keep your flowers lasting as long as possible. Sure you can DIY a flower arrangement, but for the absolute best results, give your local florist a call! If you’re interested in DIY flowers, keep an eye out for workshops available in your area. Florists all over the country offer flower arranging classes where you can learn the ins and outs of creating flowers. Today we’re going to talk about how to place an order for flowers and actually get what you’re ordering. This article is the transcript from the helpful video by our friend and pro florist, Robbin Yelverton. Too much to read? Robbin explains it all in the video at the bottom of this post! Don’t miss the video! A lot of times things seem to get lost in translation. For example, there are 3 words that people use all the time when placing an order, which are: Flowers, Bouquet, & Arrangements. It’s funny how they will use those 3 words, and in a lot of cases think those words mean the same thing. These 3 words are not synonyms. They are not the same thing when you are talking to a florist. Flowers refers to the actual flower. If you are talking about tulips, that’s a flower. Bouquet, often people will use the word bouquet in exchange for arrangement, but to us as professional floral designers, a bouquet is something you carry, like a wedding bouquet. In some cases, we refer to an arrangement of loose flowers gathered together and presented as a wrapped bouquet that someone then takes out of the wrap and places in a vase for arranging. Arrangement or design. Now that implies that it is flowers arranged in a container and then sold together in the container. So most of the time when people call in to order flowers, they’re really calling to order an arrangement. So remember to be clear. The thing about ordering flowers, it’s sorta like playing the game of 20 Questions. You have to provide enough information that the person taking the order understands what you’re saying and then is able to transfer this information to the designer to make sure it gets created the way you wanted, and then gets delivered to the person it’s supposed to go to correctly. Robbin Yelverton is BACK with even more wise words for us flower lovers! Sometimes when things around the flower shop are hectic, it’s easy to fall into the slump of creating the same types of arrangements over and over again. Well, it’s time to BREAK THE MOLD! Robbin is here to show us how to use the same materials we would use to create a “roundy-moundy” flower arrangement, and turn it into something more stylish! People like to see things they’ve never seen before, whether it be film, art or flowers. Instead of ‘Oh, well that’s pretty,’ make your customers say WOW! and want to show it off to all their friends! A florist is so much more than a person who delivers flowers. They are stewards of life’s celebrations and most important occasions. Betsy Hall of Hall’s Flower Shop & Garden Center in Stone Mountain GA really says it best in this clip from the 2012 Great Lakes Expo interview with FSN’s Brock Atwill. Truly a must-see! FSN President Loranne Atwill and floral artist Robbin Yelverton, AIFD, AAF, CF, PFCI, led a hands-on workshop at the Great Lakes Floral Expo earlier this March. This workshop was a little different than the ones you usually see at state floral shows because it dealt more with photography than design. Attendees learned techniques they could use to take better photos of their floral designs. You have a Website… now you want to put your own custom designs on it. The arrangements look wonderful, but the pictures just don’t do them justice – sound familiar? Learn great tips to making Web-worthy designs and photos in this session! You will make an arrangement in class, then learn how to photograph it for quality pictures for the Web. No matter what skill level or type of camera, Robbin gives actionable ideas for getting the most out of your flower photography attempts. Over the weekend, our team headed to the 2012 Great Lakes Floral Expo in Grand Rapids, Michigan. There, we met up with Betsy Hall, Hall’s Flower Shop in Stone Mountain Georgia. FSN’s own Brock Atwill had the opportunity to interview Betsy. Thanks so much Betsy for the interview! Keep an eye on the Bloomin’ Blog for more from the Great Lakes Floral Expo 2012! Last week, while our team members were at the Florida State Florists’ Association Design Summit, they took a detour to visit one of our great member florist, Tim Ryan of Botaniq in Santa Rosa Beach Florida. Tim was in the middle of teaching a Butterfly Garden Workshop right there at his flower shop! You might be surprised at all the things local florists are doing these days to bring back the love of flowers in their community. This isn’t Tim’s first workshop, he’s done: fresh cut flower arranging, orchid gardens, terrariums and more! Guests get together and learn what it takes to create a beautiful floral designs and gardens, as well as the techniques it takes to take care of them all. For the butterfly garden, guests will put together a beautiful planter filled with tasty plants for butterflies. Tim shows his workshop guests how to take their planter to the next level by adding river cane as a trellis. A simple technique that adds big impact! So, watch Tim in action as he hosts his workshop in the video below! Yesterday in the blog we shared a little bit about our recent trip to the Tennessee State Florist Association Convention, but today we’re taking you along for the ride! I (Mandy FSN) kept my video camera with me as I strolled through the convention. I set out to make a video for our florist friends who couldn’t make it to this particular convention, so they could be part of this event too. Hope you enjoy! Would like to say a special thanks to everyone who helped out with this video! And EVERYONE else who was at this year’s Tennessee State Florist Association’s Convention! Hope to see you next year!